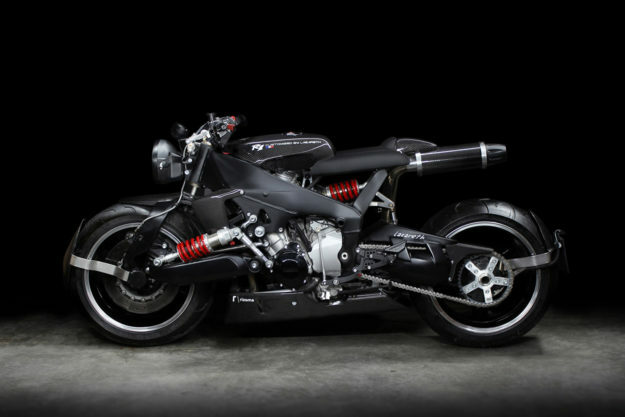 It’s pretty common for a crashed bike to become a custom project. 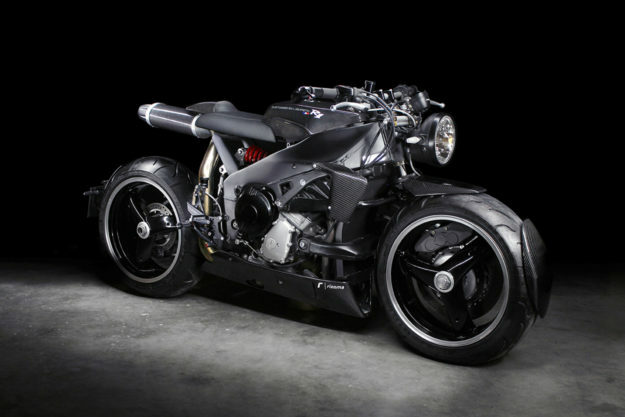 But how often does a bike get built for a movie, crashed on set, and then rebuilt? It’s the kind of weird story—and motorcycle—that could only come from Frenchman Ludovic Lazareth. Lazareth is a man in demand. When he’s not filling customer orders, he’s designing and prototyping for other brands. So it’s fascinating to see what he does with no customer or brief to tie him down. What you’re looking at is a 1999 Yamaha YZF-R1 with a storied past. 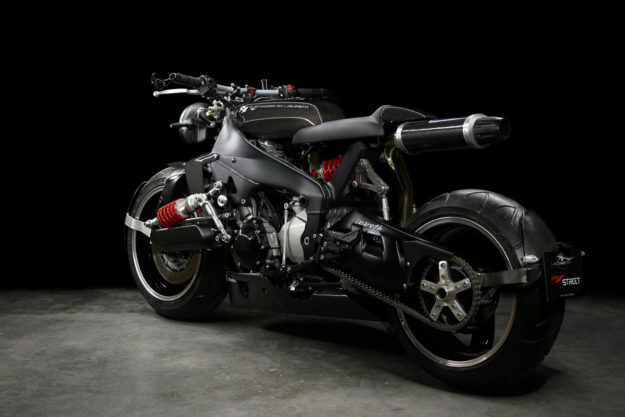 It’s one of several vehicles that Lazareth customized ten years ago for the Vin Diesel sci-fi film Babylon A.D.
For the last year, Lazareth has been putting his spare time to good use: He’s reimagined the retired movie star as a futuristic café racer. The biggest visual hit comes from the revised chassis. 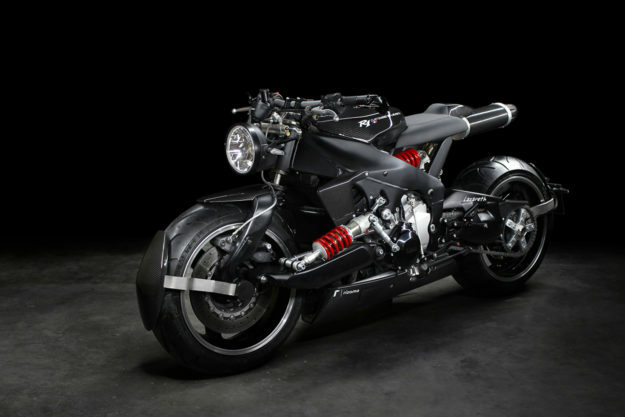 The R1 had already loaned its forks to another stunning project, so Lazareth decided to build a new front end—with a swing-arm setup. 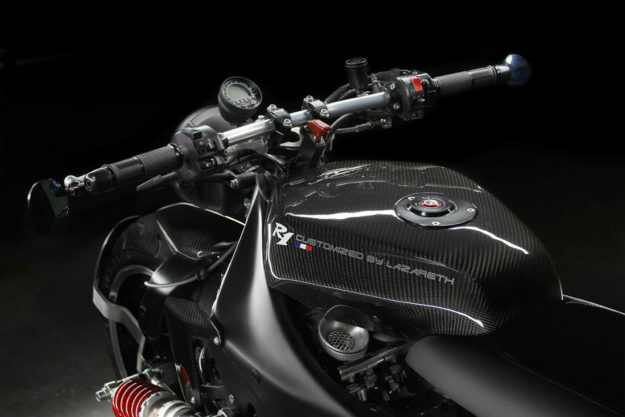 There are now single-sided swing-arms at both ends, each holding a 17” Triumph Daytona 955 rear wheel. The shocks are custom-built units from TFX Suspension, and there’s also a new floating linkage system at play out back. The frame’s obviously undergone extensive modification to make the system work, but it’s also been abbreviated at the rear. There’s a new perch up top, sitting neatly in line with the extended exhaust can. Take a closer look, and you’ll notice LEDs embedded around the end cap, acting as a taillight. The tail hump, belly pan, and various other body panels are all carbon fiber numbers. The fuel tank’s outer is carbon too, but there’s an aluminum reservoir hiding underneath. 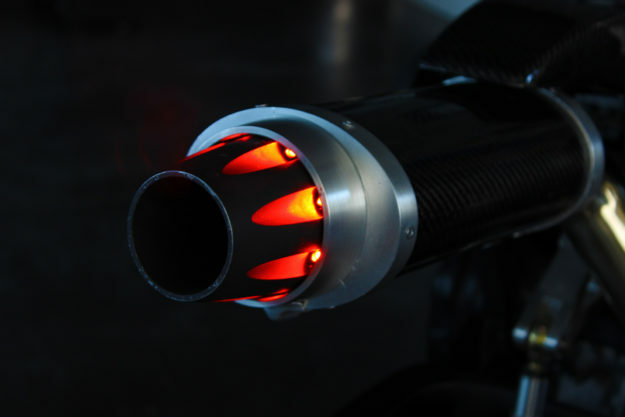 Lazareth designed the tank to taper towards the seat, offering the rider a glimpse of the velocity stacks doing duty below. Other superbike-worthy upgrades include Brembo brakes, and an array of high-quality Rizoma parts. 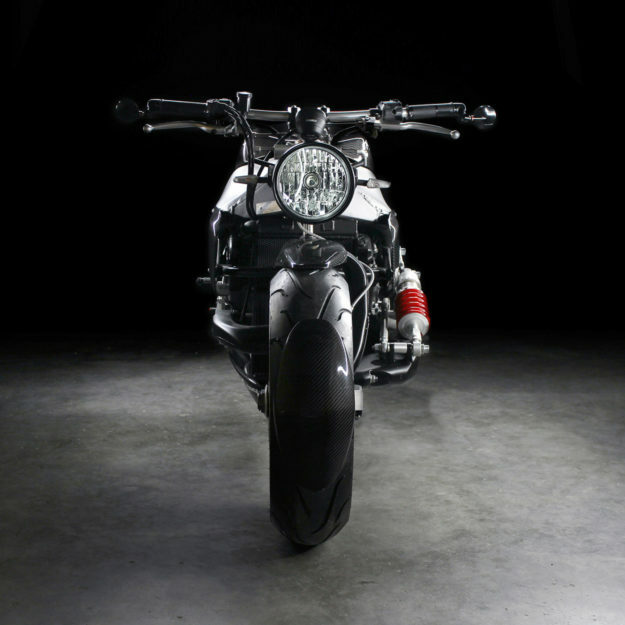 The cockpit’s sporting drag bars, bar-end mirrors and an Acewell digital speedo. 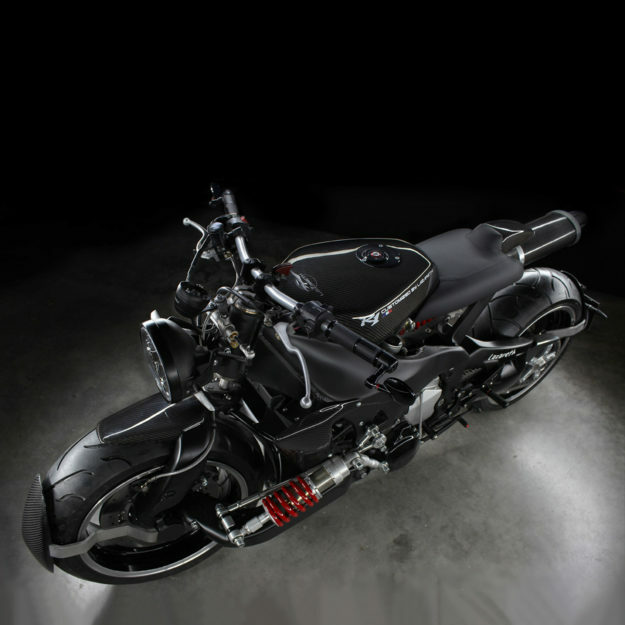 According to Lazareth the R1 handles like any other street bike on the road—but turns heads like nothing else. If you’d like to test that theory, he’ll let it go for a cool €50,000—which is $53,000 if you live on the other side of the Atlantic. Pricey? Oui. But you can guarantee there will never be anything else on the road like it, ever. And in a cookie cutter custom world, that’s got to be worth a lot.